Residents of the small desert towns around the Erongo Mountains were startled from their beds when a very loud noise resembling a prolonged explosion was heard early on Sunday morning. No explanation for the mysterious explosion was forthcoming and people started to speculate that it might have been an earthquake in the area of Karibib. 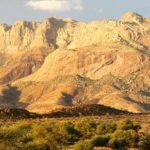 Geological formations under the Erongo Region have been known to produce mild earthquakes from time to time. The noise was heard in Usakos, Omaruru and Karibib and on all the farms in between. Some people reported that they heard the loud explosion like noise as far away as Swakopmund. Some speculated that it might have been a meteorite or space rubble entering the Earth’s atmosphere at supersonic speed which caused the loud noise. Some even speculated that the loud noise could have been caused by the reusable SpaceX rocket or parts of it that returned to earth after delivering the experimental Dragon crew module to the International Space Station over the weekend. Another explanation that was postulated was that small scale miners in the area of the Erongo Mountains used a large amount of explosives to break rocks or that the gold mine at Karibib did and unscheduled blast in the open pit. Some even said that it might have been a sonic boom caused by fighter jets taking off or landing at the Karibib Air Force Base. The loud explosive sound could also have been the result of an electric storm in clouds during the night but no significant thunder storms or rain was reported in the area over the past 24 hours. A search on the internet for earthquakes did not indicate any significant geological anomalies in the Erongo Region and the cause of the explosive sound still remains a mystery.